A classic stacking toy decorated with Sophie the Giraffe's picture to encourage baby's development. These 8 very colourful flower-shaped cups are decorated with a pretty pattern featuring Sophie the Giraffe and all her friends. There are plenty of different ways to play with them, to help your baby at various stages of his development. At 6 months, he will enjoy handling them and love feeling the textured animals in the bottom of the cups. At 8 months, baby will love filling them with water and then pouring it over himself, while learning about cause and effect and basic concepts such as empty and full and heavy and light. 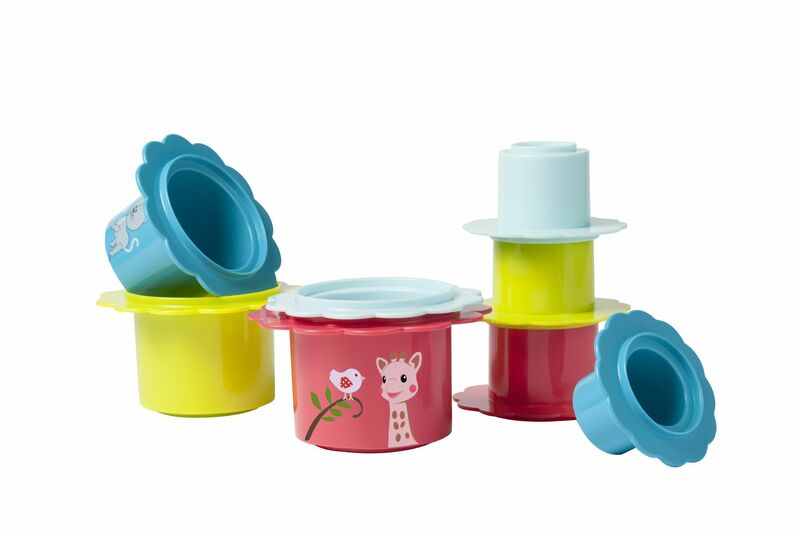 From the age of 1 year onwards, as baby becomes more dextrous and begins to grasp the concept of big and little, these cups are great for stacking and nesting. The Sophie the Giraffe patterns help stimulate baby's imagination and encourage him to make up his own stories.